Celebrate the release of Issue 4 of New Life Quarterly magazine! 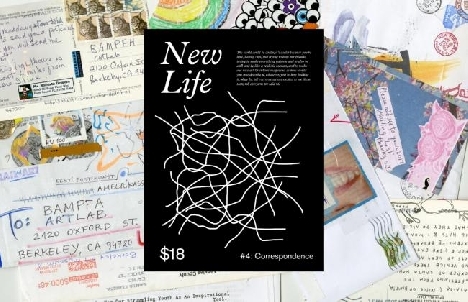 Published by Oakland-based bookstore and downtown community arts hub Wolfman Books, New Life is focused on the intersections of art and communityespecially the exuberant, overlooked, and experimental marginsin the Bay Area and beyond. This issue is a special project dedicated to artist correspondence. Through emails, WhatsApp messages, Google Docs comments, voice memos, and actual letters, artists (including BAMPFA's Art Lab) engage in conversation across mediums and around the globe. Come snag a copy of the magazine, make your own correspondence art in the Art Lab, and hang with contributors and editors.